We had such a GREAT turnout Saturday, and had a blast! People from high school (that I hadn't seen from high school), old coworkers from years ago, and many others who read the article in the newspaper, showed up to support Gavin. We are very thankful for each of you. You all made this a very special day for our family, one we will never forget. A special thank you to the Sheriff's Dept for their dedication to this cause, to make it possible. I have to download all my pics, but here is one of Gavin and Landon, shortly after the race. Again, hoping I get the camera out of his face! Ok, mom. I will humor you, and open just a little. Now take the pic and give me my cereal. HA HA... good tickle mom. Now I'm really getting hungry. Hurry. This is getting a little out of hand lady. What else do you want? Seriously, get the camera out of my face, or I'm calling dad. He CANNOT stand his hat. He CANNOT stand his sunglasses. But LOVES the beach and the sand, so we compromised. and he was a happy camper as long as he was jumping! If you live in the Chino area, you should really pick up the Chino Champion! Gavin made the front page. I look a little jolted, because the only way Gavin is really happy and not doing the eye pressing, is when he's standing and jumping! Troy and Landon looked straight and smiled continously for about 30 seconds so we could get a good pic of Gavin. It was pretty funny. It was really nicely done, thank you Chino Champion! Next Saturday’s Chino Hills Challenge 5K run/walk at Chino Hills High School will have special meaning for the Stevens family of Chino. Gavin Stevens, 7-month-old son of Troy and Jennifer Stevens and younger brother of 5-year-old Landon, will serve as grand marshal of the event, three months after Gavin was found to likely have a condition that is slowly taking his sight. The Chino Hills Sheriff’s Department, which hosts the annual 5K run/walk, said $5 from all participants who mention Gavin Stevens on their registration form will go toward a fund for the boy. That money could be used for Gavin’s medical costs, future schooling, Braille Institute classes and travel expenses, Mrs. Stevens said. The Chino Hills Challenge is scheduled for 7:30 a.m. at Chino Hills High School, 16150 Pomona Rincon Road. Registration forms are available at pacersrunningclub.comoractive.com. No cure is known for Gavin’s condition, Leber congenital amaurosis (LCA), Mrs. Stevens said. “It’s predominately a blindness that is present at birth. There are different variations and degrees of LCA. We think he has a pretty severe case in both eyes,” Mrs. Stevens said. Two months later, she noticed Gavin wasn’t tracking objects with his eyes as he should, but the child passed every test the doctors administered. “A doctor told us some children develop a little later than others, but bring him back in four months and we’ll check him again,” Mrs. Stevens said. LCAis a hereditary condition, but the Stevens family knows of no previous cases, Mr. Stevens said.“ This is completely new to us, so we are kind of taken back a little bit and now we are just trying to learn about it,” he said. Doctors said either one parent carries the gene and it manifested itself in a mutated form — a 1 in 800,000 chance— or both parents are carriers of the recessive gene and it matched up, Mrs. Stevens said. “Right now, we are still unsure how exactly Gavin got it,” she added. The family is currently working with Children’s Hospital in Los Angeles, but their medical insurance will not approve an Electro Retina Gram (ERG),which would confirm if Gavin has LCA. “It was not approved the day before Gavin was to have the procedure,” Mrs. Stevens said. An ERG, similar to an EKG of the heart but for the eye, can get deep into the eye, take pictures, test light stimulus and see what the brain can see. “By looking at him more in depth, the doctor would be able to tell if he has LCA. If so, the family would have to have blood tests done to see where the gene lies,” Mrs. Stevens said. Eight people worldwide diagnosed with LCA have been cured through gene therapy. “That’s what we are trying to push for. I personally believe awareness is the key to funding and we’re active fundraisers for the Foundation Fighting Blindness. They have provided a lot of funding toward these clinical trial studies,” Mrs.Stevens said. Troy and Jennifer Stevens are lifelong residents of Chino. 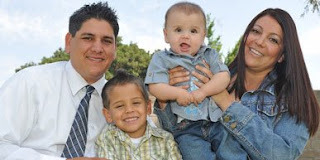 Mr. Stevens, 32, is a 1995 graduate of Don Lugo High School. Mrs. Stevens, 34, is a1993 Chino High School graduate. 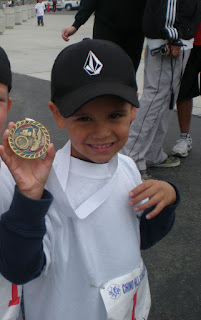 Last year, they registered Landon to play baseball with Chino National Little League. He wears No. 2 for the T-ball Pirates. Chino National Little League board member Mark Higgins and his wife M.J., both sheriff’s deputies in Chino Hills and head organizers of the Chino Hills Challenge, heard of Gavin’s condition and wanted to help. “We are really grateful to Chino National being so kind. This is our first year with the league,” Mr. Stevens said. Landon has also been a big help to his little brother, the parents’said. “He’s really good with him. From day one, we told him, if you talk to him, just get close,” Mr. Stevens said. “He’s always rolling over,” Landon said with a big smile. Mr. Stevens said Gavin is functioning as a 7-month-old should, including crawling. “We’re making sure his development stays on track. His hearing is fine and all other motor skills are fine,” he said. Mrs. Stevens said the family is already learning to read Braille — Gavin too. And a reminder of what a ham I truly have in this one! Gavin had his first encounter with the Braille Institute today. We met some other families in Moreno Valley at a park. The other children were also visually impaired, and one little girl who is two, has similar assumptions of diagnosis as Gavin. It was nice to see her up close and interact with us. I had Gavin sit right next to her on the table, and she felt her way around his leg and feet. He felt her back, and was rubbing her arm. It was adorable to see! He sat so still right next to her. It's funny how it is not taught, but the fingers and hands become their eyes. Gavin will be visited by the at-home teacher starting next week. She will work on his development, and make sure he stays on track. From what she observed today, she said his visual impairment is not negatively impacting his development (speech, motor skills, etc..). We hope that continues, and she will work with him, and me. She felt he was right on with where he should be, which is what his pediatrician says as well. I notice him not sitting up with much strength yet, but that will all come. I'm so excited we are meeting other families. I know he's young and probably unaware, but it meant a lot to me for him to sit right next to that little girl, who has been through what he is going through. I looked at these two little people, and it was encouraging to see their interaction. It moved me, and they had not a clue! We are hoping to meet with the other familes on a regular basis. It will be nice to see each others children grow and mature as well as share stories, concerns, and triumphs. We also have registered for the Families Connecting with Families International Conference. It is in July, and it's a whole weekend event packed with hands on resources, doctors, loads of info, etc. I'm SO excited! Here is another video. This is a quick peek into the topic of gene therapy for LCA specific blindness. Like I mentioned before, if the doctors suspicion is correct, and Gavin DOES have LCA (Leber's Congenital Amaurosis), gene therapy will be an option for him one day. This study been in the works now for about 15 years, and the trial studies have helped blindness in I believe 8 people (the last count that was mentioned at the conference). Even if this isn't something that can help Gavin soon, my heart goes out to the parents of these young individuals who have participated in the study. To imagine seeing their children gain sight, is a moment in my life I only can dream of right now. To know they are actually going through this, makes the hairs on my arms stand up. I commend them for their patience in the long, enduring study. I hope they are gratified by every moment given to them as their children begin to visually make out the outline of their face, and eventually, God willing, every last detail of their phsyical features. I can only imagine the feeling, and am patiently waiting for our day. Excerpt from another participant, age 22. 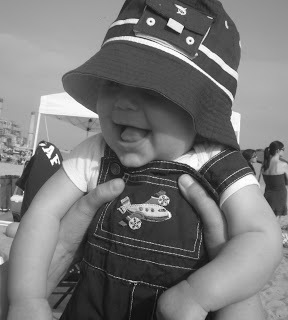 He had the gene replacement surgery on Jan. 31, 2008. Since then, he has emailed Dr. Jacobson, the researcher who has been working with Turner for 14 years, to thank him and the many other scientists who have brought him to this day. “I said that every morning I wake up and look at the sun rise, and every day it goes down, and I think these things are so priceless. And they gave me that gift,’’ Turner says. PS - Thank you Uncle Herb and Shannon for sending this to me. Gavin had his check up today and some shots (boo). 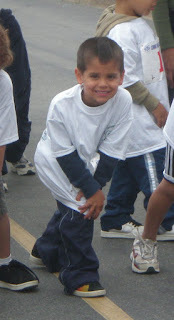 He is still on track developmentally (motor skills), which is refreshing to hear. Close to 70th percentile in height/weight. We decided on an antioxidant for him to take. This can slow retinal disease progression, and improve eye health. It won't fix what he has, but can slow down the disease, which is big, because what he has, has the potential to be degenerative. For all of you with eye problems, retinal problems, etc.. PLEASE get on an antioxidant supplement. It can be HUGE for preserving the site you do have. I have a few names that were given to me, they are over the counter, so no prescription is necessary. Let me know and I can share the info I have after doing some research. The problem we had, which I found very odd, we couldn't find an antioxidant supplement for infants or even children? If in fact, Gavin does has LCA, and it has been proven supplements can help, and LCA forms are present at birth - then why aren't there any which can be given to children? There ARE babies born with vision loss, there are children with vision loss? It's not just a degenerative macular disease adults get? We had to call manufacturers, speak to pharmacists, etc. Finally, Dr. Warren (Gavin's pediatrician), felt safe to go with a particular brand. It's kind of a Mickey Mouse job as far as dosage, because I'm only going to give him 1/3 of the recommended full capsule. The capsule is powder, so I'm going to be dividing this powder up into thirds.